THERE IS A GREAT DIFFERENCE BETWEEN DROPPING THE ANCHOR OVER THE SIDE FOR A QUICK DIVE AND ANCHORING A BOAT FOR THE NIGHT. THIS IS ONE OF THE FIRST THINGS YOU LEARN IN MARITIME NAVIGATION. THIS IS A FAST OVERVIEW OF BASIC BUT IMPORTANT ANCHOR TRICKS AND TIPS. The proper technique for anchoring starts with ensuring that the boat is completely immobile at the spot where you want to anchor. You have to play precisely on the throttle to stop or you will drift and thus drop the anchor at the wrong place. Wait till it’s still. You will need to know the depth and therefore the chain length to put, as this will affect where the boat will be once the anchor is blocked. The experience and the local knowledge of the type of bottom are of great help. Provide a ratio of 3 to 1 (at least) between the length of the chain and the depth of the water. At slow speed, aim the boat’s nose at the wind or current, beyond where you want the boat to stop, at a distance equal to the expected chain length. Immobilize the boat. When you have dropped the anchor and the length of chain you wanted, stop the windlass or pass the chain or rope onto a cleat. Then reverse gear 3 seconds to make sure the anchor is holding the boat. With the anchor thrown, secure the chain and ensure that it passes well in the bow anchor roller so that it does not damage navigation lights or other equipment during the movements of the boat. Then take 2 landmark and use your GPS chartplotter, radar and / or depth sounder to check your position and make sure the anchor does not drag. Verify your position from time to time. Your chartplotter will usually show you what to expect, but sometimes nature reserves a few surprises and the bottom is not the one indicated by the GPS. The most common bottoms are sand, mud, clay and seaweed. Most popular anchor styles (Danforth, CQR, Delta, Spade, Bruce, Rocna) are considered suitable for all these conditions. That said, plow anchors like CQR or Delta hold best on a rocky bottom, a Danforth is best in mud, and heavier anchors hold the best in seaweed. In general it is advisable to avoid anchoring in seaweed, because it can form a “ball” of seaweed on the anchor which loses its ability to hang. The anchor of the boat should be properly sized for your boat. A slightly heavier anchor may be recommended especially if you have an electric windlass to do all the work. But obviously never install a lighter anchor. Check the anchor manufacturer’s guide for the length, weight and hull type of your boat. 8. Chain or chain & rope? A small boat of 6 meters will be able to settle with a mounting chain + rope and it will be enough to spend the day. On the other hand a boat which will have to spend the night at the mooring will have to be equipped with a line 100% chain. Remember that big boats swing more slowly and tend to have a bigger range than smaller ones. Boats with a lot of large wind surface area will turn faster in strong winds. Make sure you continue to check for landmarks that you have taken and check that your position does not change. 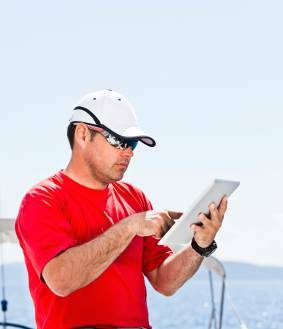 Set the boat anchor alarm on your GPS / chart plotter (there are even apps for that!) if you have one, to warn you if something changes while you are asleep or busy. Then take out the sandwiches and enjoy the view. The anchoring techniques are identical, with or without windlass. Keep in mind that a windlass is not a cleat and should not take charge of your boat the best is to put a shackle on the chain and a rope moored to the cleat. The same goes when lifting the anchor : the windlass does not pull the boat. When going ou of the anchorage, with the help of a crewman at the front, make sure that the chain is permanently vertical to the windlass to relieve it. This article is a basic overview of mooring, there are a lot of techniques to strengthen the mooring, make it more pleasant, facilitate the anchor if it is blocked which may be the subject of a new article in the future. If you need any advises and help for the maintenance, the detailing and cleaning of your boat on the French Riviera, please fill in the form below or call us +33699524639.